The WBA is a Bellingham, Washington-based business advocacy organization, founded in April of 2012 by Tony Larson, nicknamed “Tea Party Tony” for his activities over the years in local politics. What Larson described as a “moratorium on fossil fuel exports,” is more precisely a 6-month interim moratorium that was approved by the Whatcom County Council, prohibiting the filing, acceptance and processing of applications and permits for new or expanded facilities that would facilitate the increased shipment of unrefined fossil fuels out of Cherry Point. 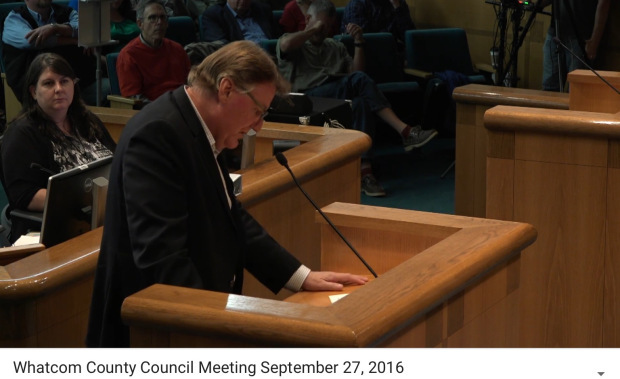 That 6-month interim moratorium stems from when the County Council, on August 9, 2016, originally approved an emergency moratorium imposing a 60-day temporary moratorium prohibiting the filing and acceptance of applications for County permits for any new or expanded facilities which would facilitate the increased shipment of unrefined fossil fuels coming out of Cherry Point. Since that emergency moratorium, the County Council has subsequently approved three additional 6-month interim moratoriums extending that same policy, the most recent of which, Council approved on September 26, 2017. On February 27, 2018, the County Council will hold a public hearing on this matter, to decide whether to extend the policy for another 6-months. The interim ordinance imposing a moratorium has been vital to providing land use planning policy guidelines which strengthen protection to the critically sensitive marine environment in and around the areas at Cherry Point, as well as to the culturally and spiritually significant properties of Lummi Nation, to protect Lummi treaty rights, and to protect public health and safety during the time period that the Cherry Point Amendments had been under review for the County’s recent Comprehensive Plan Update. The interim ordinance has also continued to be vital in order to ensure that a study examining Whatcom County’s powers to limit unrefined fossil fuel exports from Cherry Point (directed by the Cherry Point UGA Amendments to the 2016 Comprehensive Plan Update), would be undertaken and completed. Cascadia Law Group PLLC was hired by Whatcom County in 2017 to examine the County’s powers to limit unrefined fossil fuel exports from Cherry Point, with the intent to reduce adverse impacts from fossil fuel projects. That is the same study which Tony Larson’s WBA tried to prevent, misrepresenting to the public the intent of the study. Cascadia Law Group PLLC released its 293-page report on February 12, 2018, and now the County Council needs time to review, consider, and potentially take action on the report’s findings. Also, there needs to be proper time afforded to the public to weigh-in on any new policies that Council may want to set in place in an effort to protect our community from the adverse impacts which occur from fossil fuel transshipment facilities at Cherry Point. 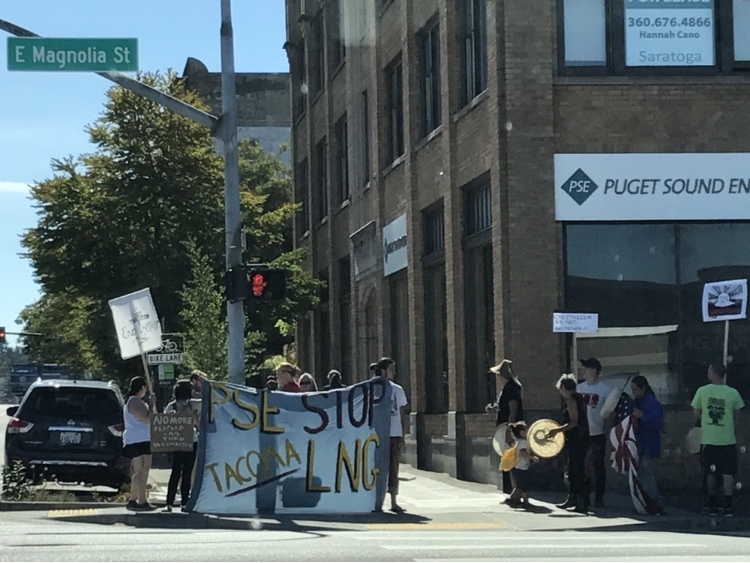 The first demonstration that Larson referenced in his column was an August 24, 2017 demonstration which occurred at the Puget Sound Energy (PSE) office on N. State street in Bellingham, Washington. The demonstration was to express opposition to PSE’s LNG plant project at the Port of Tacoma, and to support the Puyallup Tribe’s strong opposition to the LNG plant which is sited right next to where the tribe’s residents live, and threatens their fishing, their waters and air. According to Larson’s column, the WBA had invited representatives of the Bellingham Police Department to provide a presentation at a September 2017 WBA board meeting to discuss the rights of a business in the event of an unwanted demonstration. Several BPD officers, including then-Deputy Chief David Doll, participated in the presentation meeting with the board. It was concerning to me that a Deputy Police Chief for Bellingham, generally recognized as a fairly liberal city, would be strongly encouraging businesses to prosecute non-violent protesters who would be arrested for trespass. Also, in the opening sentence in Larson’s column, when describing the August 24, 2017 demonstration which occurred at the PSE office, he made what I suspected was, and what turned out to be, a false claim. From all accounts of the August 24th action that I had seen, and from watching various video recordings of parts of that action which were posted on Facebook, I did not understand how WBA President Larson could have made such a claim. So, I contacted then-Deputy Chief David Doll, to speak with him about that claim and about the quotes attributed to him in Larson’s column. Doll was promoted to Bellingham Police Chief in October of 2017, after then-Police Chief Clifford Cook had announced he would retire on November 30, 2017. Doll became Police Chief effective December 1, 2017. I spoke, via telephone, with then-Deputy Chief Doll on October 19, 2017, and asked him several questions about Larson’s column in the WBA’s Business Pulse Magazine. The next day, I also traded emails with Doll regarding some follow-up questions I had for him. After I read Doll the opening paragraph of Larson’s column, I asked him if Larson was correct when he claimed that the demonstrators “unlawfully entered” the PSE office in Bellingham. Larson, in his column, also referenced a February 2017 demonstration that occurred at the U.S. Bank in Bellingham, and he falsely claimed that those demonstrators had “unlawfully entered” the lobby of U.S. Bank. Just like the PSE office, the bank is open to the public, so, once again, Larson makes an untrue allegation about those demonstrators. The February 4, 2017 action by demonstrators at U.S. Bank was in opposition to the Dakota Access Pipeline, and was part of the “Divest From DAPL” national campaign which was applying pressure to financial institutions such as U.S. Bank, to withdraw their support of the company wanting to build the Dakota Access Pipeline, Energy Transfer Partners. The timing of the February 4 demonstration last year was likely influenced by President Donald Trump’s January 24, 2017 executive action advancing approval of the Dakota Access and Keystone XL pipelines. Regarding the 2017 Bellingham PSE demonstration, it did not appear that the demonstrators were asked by PSE to leave the premises. Doll said that on August 24, “ten non-violent protesters were in the lobby — we monitored in the area outside.” BPD did not go into the PSE office. He explained that the complainant, Lynn Murphy, had notified BPD about the demonstration. Lynn Murphy is the local Government Affairs Representative for PSE. It’s my understanding that because PSE did not grant that authority to the BPD, that is why officers did not take any action other than monitoring from outside. In my October 19, 2017 phone call with Doll, I asked him why it sounded like he was encouraging businesses to prosecute non-violent protesters who are arrested. I’m unsure why Doll said the protesters, “are taking our [law enforcement’s] time and violating the law,” when he had just explained to me — and I believe his fellow officer, Lieutenant Almer, had also explained to the WBA board — that unless the businesses ask the protesters to leave their premises and they don’t leave, and unless the police are called by the businesses and after the police would give protesters the opportunity to leave voluntarily, they don’t leave, then only in that circumstance would the protesters be “violating the law.” As previously stated, demonstrators in both the PSE and the U.S. Bank demonstrations, left voluntarily. It is unclear exactly what difference Doll thinks would occur in the long term if businesses were to support law enforcement from arrest through prosecution. To sum things up, contrary to Tony Larson’s statements in his column, the non-violent demonstrators who participated in both the PSE and the U.S. Bank demonstrations last year, did not unlawfully enter either of those business establishments. Larson made his false claims of illegal entry, while cheering on the very types of fossil fuel projects from which water protectors were trying to protect their community and others. Meanwhile, BPD’s David Doll could not provide any examples of protestors being emboldened in our community by what he said was a lack of accountability. Speculative alarm about trespass and false alarm about illegal activity regarding local demonstrators, coupled with any statements prompting business owners to be willing to support the potential arrest and prosecution of demonstrators to the fullest extent of the law, seems unwarranted and irresponsible. What’s more, it creates a climate that could chill the exercising of First Amendment rights to free speech and assembly by members of our community. This entry was posted in Blog Post, Commentary, Information and tagged Bellingham #NoDAPL Coalition, Bellingham Police Chief, Bellingham Police Department, BPD, Business Pulse Magazine, Cherry Point, Cherry Point Amendments, Cherry Point Aquatic Reserve, Cherry Point Herring, Cherry Point Industrial Area, Cherry Point Industry, Cherry Point UGA, City of Bellingham, Comprehensive Plan, Dakota Access Pipeline, David Doll, Liquified Natural Gas, LNG, Standing Rock Sioux Tribe, Tony Larson, U.S. Bank, Urban Growth Area, WBA, Whatcom Business Alliance, Whatcom County, Xwe'chi'eXen. Bookmark the permalink.